Were PKP Cargo responsible for the tank wagon? 16 people have been killed and some 50 were injured last night in the Italian coastal resort of Viareggio after a goods train consisting of 14 LPG tank wagons derailed. The local fire brigade said that the gas spilt from the wagons had reached neighbouring houses before it exploded. The ensuing fireball engulfed people, vehicles and buildings like something out of a horror film. Several victims survived the blasts but were killed when their houses collapsed on top of them. The train was travelling through Viareggio on its way from the port of La Spezia to Pisa. The driver of the train, who was only slightly injured, reported feeling a jolt some 200 metres after his engine had passed the Viareggio Station. Shortly afterwards, 5 wagons at the rear of the train derailed, some fell on their sides and the LPG started to leak out. There then appear to have been at least two major explosions. Accident investigators will be concentrating on the condition of the wagons and the track at the point where the accident occured. There seems to be some confusion as to who was responsible for operating and maintaining the wagon that jumped the rails. The Times reported yesterday that the derailed wagons were registered to PKP Cargo and Deutsche Bahn, while The Independent reported that the lead derailed wagon – which suffered a buckled or broken axle – was owned by the US company, GATX Corp.
During trials carried out by the Centrum Naukowo-Techniczne Kolejnictwa, the Polish Railway Research and Technology Centre, a train consisting of two Siemens Eurosprinter ES64U4 locomotives – one at each end – and three Z1A coaches reached 235 km/h – a record for a locomotive hauled trains in Poland. The trials were carried out on the nights of 27/28 and 28/29 May at a time when no other trains were running on track 1 on the CMK line between between Psary and Gora Wlodowska. 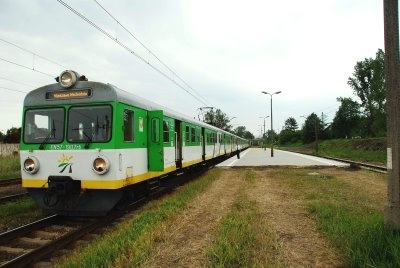 They were part of the homologation process necessary before the locomotive can be granted type approval by the Polish railway regulator, Urzad Transportu Kolejowego, the Office of Railway Transport. On the first night, the train reached 210 km/hour, on the second, 235 km/h (146 mph). The locos as delivered to Poland would seem to be speed governed as the driver reported that at top speed the power appeared to be cutting out. The Eurosprinters delivered to Austria are not so inhibited. The world’s fastest locomotive is now Eurosprinter 1216 050-5, a multi-system locomotive owned by Austrian Federal Railways (ÖBB). It reached a record speed of 357 km/h (222 mph) on the new Ingolstadt – Nuremberg line. The top speed ever achieved by a train in Poland is 250.1 km/h (155mph) achieved by a Pendolino ETR 460 multiple unit in 1994. That record run took place near Biala Rawaska also on the CMK. Polish TV news reports the record. Edward Teague, aka Postman Patel, aka Lord Patel was one of Britain’s finest bloggers. At times a botanist, industrialist, writer and artist he was also a railway enthusiast and offered encouragement to BTWT during its early days. He was the great grandson of LB&SR Chief Mechanical Engineer, William Stroudley. The latter was the designer of Gladstone, the first railway engine ever put in a museum, which can still be seen today in York. Edward Teague had excellent sources and his UK TOP SECRET Postman Patel blog maintained a long tradition in British journalism of exposing corruption and misjustice. It carried many stories which others were afraid to publish or knew that they would never have seen the light of day in the mainstream media. Never a political activist in the traditional sense, he was a genuine libertarian with no time for the humbug and rhetoric of the left and right. The blog he ran as Postman Patel/Lord Patel became a port of call for anyone seeking to unravel what was really going on behind the headlines. His scientific training made him ask questions, and seek answers, where others feared to tread. Never daunted, though sometimes dismayed, by a changing world, he throve upon challenge, to which he brought a perspective which spanned two centuries and drew upon many contacts – whether he was discussing the De Menezes shooting, the fact that the US brought greater firepower upon Libya in 1986 than the English had done in the Falklands… . A slighty longer version of this article appears on Tunnel Vision. Model maker at work. Photo Muzeum Kolejnictwa. The Warsaw Railway Museum’s model workshop at Jelenia Gora is to close when its last orders are fulfilled. At its peak the workshop employed 30 people, making large scale models of historical rolling stock. A large scale model locomotive would usually take a model maker one year to construct. Janusz Sankowski, who filled the post of museum director for many years, cared little for full sized exhibits, and once famously told Fedecrail President, David Morgan, that the future for railway museums lay in displaying models of historic railway exhibits. 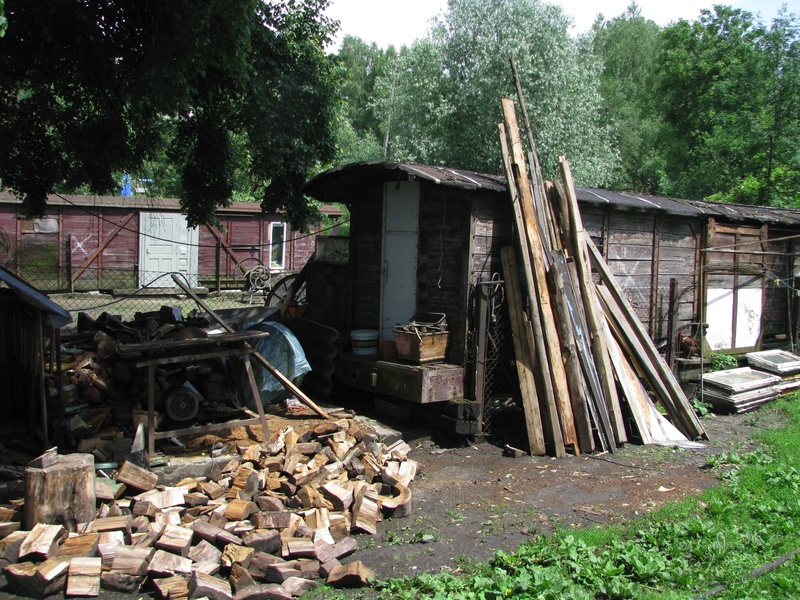 Negotiations between PKP Estates Department – who want to clear the museum site for redevelopment – and the Office of the Governor of Mazowsze Province – who own the museum’s exhibits – are currently deadlocked. Until matters are resolved the museum’s priceless collection of historical railway exhibits continue to deteriorate in the open. Ferdynand Ruszczyc, the Museum’s current Director, would be interested in receiving offers from anyone interested in taking over the workshop as a going concern. Contact details for the museum’s management team are available here. 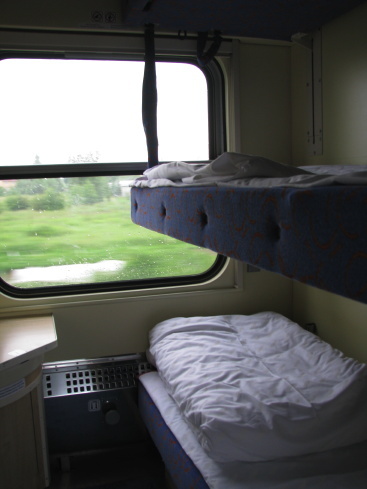 It’s been so long since I travelled on an internal sleeping car service in Poland that I had almost forgotten that they existed! The first time I tried out one of these services was in the 60’s when I travelled in a so-called ‘hotel train’ from Szczecin to Warsaw. I remember little of the journey other than that the dirty train, full of cigarette smoke, kept stopping to let more important freight traffic pass us by. The next time was in the 70s, when I travelled by sleeping car from Warsaw to Zakopane. That service was luxurious in comparison to the ‘hotel train’ and – as to be expected – more expensive. Three passengers can sit or lie in comfort. When my friends decided to travel from Przeworsk to Poznan in a sleeping compartment on the Przemyslanin – which runs daily from Przemysyl to Swinouscie between 25 June and 26 September – I was a little aprehensive. I needn’t have worried – the sleeping compartment, the corridor and toilet were spotlessly clean and remained in that condition throughout the whole journey. With the centre bunk dropped down the tiny ‘bedroom’ became a very comfortable sitting compartment. For an extra 70 zloty on top of the second class fare you get your own bunk, plus a bottle of mineral water, plastic cup, face flannel and a tiny bar of soap – luxury indeed! By Poznan the train had acquired a post office coach. On the outward journey my friends handed out some beers. Five bottles seems to be the amount that a Pole requires to sleep soundly in a sleeping coach irrespective of the quality of the track. On the return journey half a bottle of Zubrowka worked just as well and had less long-term side effects. British travellers wishing to try the same medecine are recomended to halve the quantities. Apologies for the break in posting, the last few days involved quite a bit of travelling around Poland. I hope the material that I brought back is some compensation. Today’s pictures were taken yesterday and are from a trip on a special train on the Przeworsk Railway – an ex PKP narrow gauge in Lower Carpathia that runs through scenery very reminiscent of North Wales. Parts of the line have a decided resemblance to the Welshpool and Llanfair Railway! After several days heavy rain it is clear that culverts are due for clearing and new ditches need to be laid. Although the ride is smoother than on the Smigiel line, the permanent way needs work in a lot of places. If any platelayers out there are wondering what to do now that the WHR track laying has been completed, the General Manager of the Przeworsk Railway would welcome you with open arms. Remember the last competition. The picture of the retired goods wagons (taken from the other side) stumped everybody! The line climbs the side of a valley and features some stunning landscape views. There are many viaducts and Poland’s only narrow gauge railway tunnel. The fine station building at Dynow is still in good shape. There were orginally plans to extend the line to the South along the valley of the River San to Sanok. Sadly these came to naught. Had they come to fruition the line would have been more prosperous and Dynow would have been an important half-way station. The line’s raison d’etre was the sugar refinery at Przeworsk. Now with the refinery closed the railway runs a Sunday tourist service during the holiday season plus special trains on demand and a very occasional freight service. Smigiel – Stare Bojanowo train in December 2008. Photo pedro. SLB railcars near Alltag, Austria. Photo SLB. I couldn’t resist showing these two photographs together. Sometimes a picture is worth a thousand words. Wladyslaw Reymont wrote some good books and beat off rivals Thomas Mann, Maxim Gorky and Thomas Hardy to win the Nobel Prize for Literature in 1924. Railways were a an important part of his life. His first steady job was as a level crossing keeper at Koluszki. Injured in an accident on the Warsaw Vienna Railway he was awarded 40,000 roubles in compensation. The money allowed him to fulfil his passion for travelling round Europe by train. So it is rather fitting that this year’s Reymont Day celebrations included a steam-hauled vintage train from Lodz Fabryczna to Lipce Reymontowskie, close to the village of Krosnowa where Reymont lived for a time. The organisers of the event included PKP InterCity, PKP Linie Kolejowe (PKP’s infrastructure company) and the Chief Executive of Skierniewice District Council. The sponsors included Bombadier Transportation. Now if only someone could persuade PKP LK to be equally accommodating to steam specials in other parts of the country… . Polskie Koleje Panstwowe S.A. (the PKP holding company), PKP Intercity (PKP’s long distance services operator) and the local authority owned operating company, Przewozy Regionalne (Regional services), have signed an agreement regarding the operation of their ticket offices at 19 stations. Passengers will be able to continue buying PKP Intercity tickets from Przewozow Regionalnych ticket counters and vice versa. Six months after the handover of PR’s long-distance services to IC, this “breakthrough” merits a press release all of its own. Yet, in any customer-focussed railway, the details of the new ticketing arrangements would have been worked out before the split. It is a ‘no-brainer’ that the new arrangements should have included the ability for PR ticket holding passengers to painlessly trade up to IC services and for IC tickets to be accepted on the cheaper PR services. Dyspozytor found his credit card voucher and managed to get a refund for his unused PR-issued IC ticket after all! Warsaw cares, but PKP doesn’t give a fig! I had a series of meetings all round Warsaw and chose to travel by public transport. I took a Sybka Koleje Miejska train from Warszawa Zachodnia to Warszawa Ochota, a tram to Warszawa Gdanska, the Metro from Gdanska to Polytechika, a bus to Saska Kempa, a bus to Powisle, another bus to Polytechnica, the Metro to Centrum and finally a tram to Warszawa Centralna. My journeys – 8 journeys in all – would have cost me some 17 zloty (approx £4) using the appropriate tickets for the single hops. But thanks to the ticket accord in Warsaw, negotiated by the Mayor of Warsaw with the city’s public transport operators, a single 9 zloty (£2) City Transport Department (ZTM) all day ticket sufficed for all my wanderings. Top marks Warsaw for making public transport easier. In the evening I travelled to Lodz. Now its no doubt my fault that, as a Polish transport commentator, I had not picked up the news that PKP Przewozy Rejonalne (PR) – who had handed over all their long distance Pospieszny trains to PKP InterCity – have just introduced three of their new InterRegio (IR) long-distance trains between Warsaw and Lodz. It transpired that my chosen train – the 19.45 from Warszawa Centralna – was in fact one of the PR IR services. So, together with some 20 other passengers who had made the same mistake, I had to have my IC ticket endorsed and pay 28 zloty for a brand new ticket complete with 5 zloty surcharge for buying a ticket from the guard. Don’t worry, he said, show your unused tickets to the cashier at Lodz Fabryczna and your cash will be refunded. In Lodz the lady in front of me in the refund queue explained patiently that when she bought her ticket in Warsaw she specifically said that she was travelling by the 19.45 and couldn’t understand why she was being made to pay a penalty because she had been sold the wrong ticket. She was told that she should have told the cashier that she wanted an InterRegio ticket. She countered that you shouldn’t need a Ph.D. in railway transport economics to travel by train in Poland. In my case I was refused a refund because I had paid for my tickets by credit card and had not kept the credit card receipt. I will be taking this up with the authorities! PKP, if you want to survive in the cut throat world of passenger transport, you really must learn to look after your customers. Competition 3 – We have a WINNER! Competition 3 is now CLOSED. Shortly after midnight last night John Hyde – who already held three points – made a number of bold moves which brought him one more deciding point and victory in our third competition. Congratulations John! John’s first post related to ‘Tiebreaker B’. 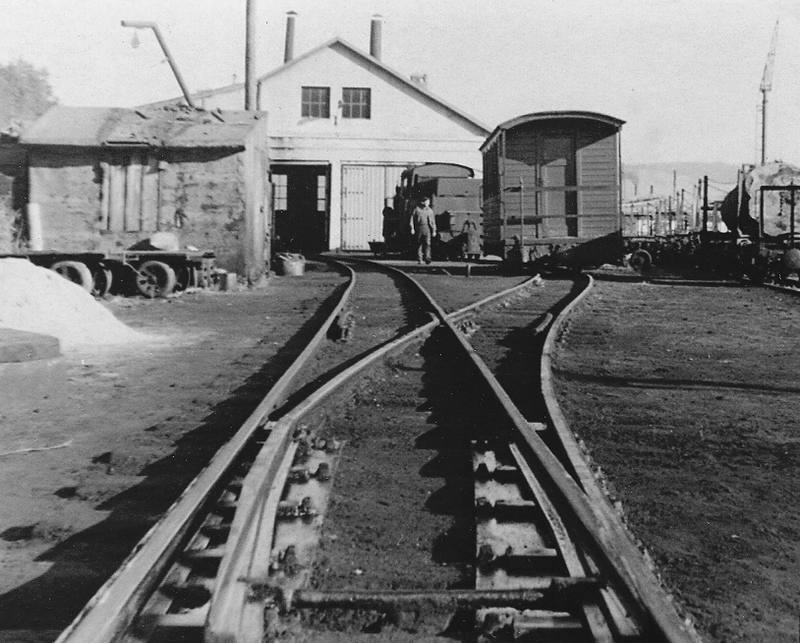 John suggested Przeworsk yard. However, while the Przeworsk line as a whole runs through hilly terrain (and has Poland’s only narrow gauge tunnel) the area around Przeworsk itself is flat and lacks the hills that are visible in the back of the picture. But there are no penalty points for a bad guess so John was still in with a chance. John’s next move 12 minutes later was to go back to ‘Tiebreaker A’ and tentatively ask, Is it Southall? Finally 8 minutes later still John had decided and made the winning post, In fact I’m convinced its Southall. I’m off to Warsaw early tomorrow morning so a detailed post mortem analysis of the Competition and the clues that were embedded in a few innocent looking articles will have to wait! Starachowice railway gets 2.8 m PLN. Starachowice Railway – The Southern section. 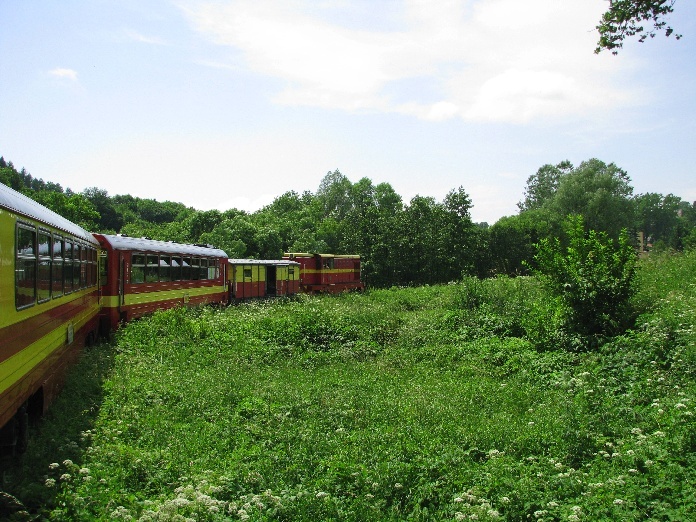 Two and a half kilometres of missing tracks – stolen by scrap thieves – are to be relaid between Marcule and Lubienia on the Starachowice narrow gauge railway thanks to a 2.8 m EU-funded project. This section of line lies in Mazowia Province and the office of the provincial governor Adam Struzik has agreed to make the cash available from the Regional Operating Programme funds. The line is in the process of being taken over by the Starachowice District Council. 85,000 PLN towards the required ‘own funds’ component will be provided by the Council with another 341,000 PLN being coming from the budget of the provincial council. The District Council – the custodians of the line – have our congratulations for progressing with the restoration of the railway and not waiting for negotiations for their takeover of the railway land from PKP to be completed. When this section of line is completed a further 3.5 km of track will remain to be relaid on the next section – from Lubienia to Lipie which lies in Swietokrzyski Province. The Council are already negotiating for a slice of the Swietokrzyskie RPO funds and provincial governor, Adam Jarubas, is reported to be well-disposed to the project. The success of the Swietokrzyskie Railway project is due to the work of lot of people. The current operator – the line’s third – is the Upper Silesia Railway Society. 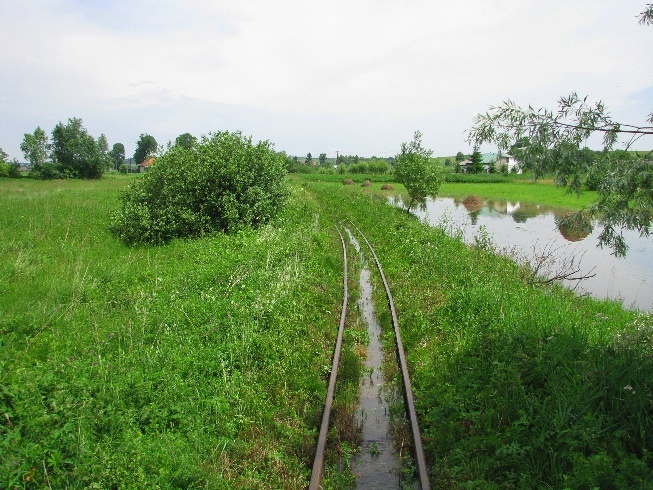 Much credit is due to members of the Polish Narrow Gauge Railway Association (FPKW) who worked hard to persuaded the Starachowice District Council to take over the line, carried out much of the initial restoration work on the line and introduced tourist services on both ends of the railway. Starachowice District Council’s enthusiasm for the line has has increased considerably since those early days. Currently, Krzystof Niedopytalski – responsible for the Council’s Culture, Promotion and Developmnt Department – is very much in the driving seat of new developments. His long-term plan is to connect the line with the Wielki Piec steelworks museum at the other end of the town. For an interactive map of the line and the iron ore narrow gauge railways which preceded it click here, and then click again on the phrase, “kliknij aby przejść do mapy”. 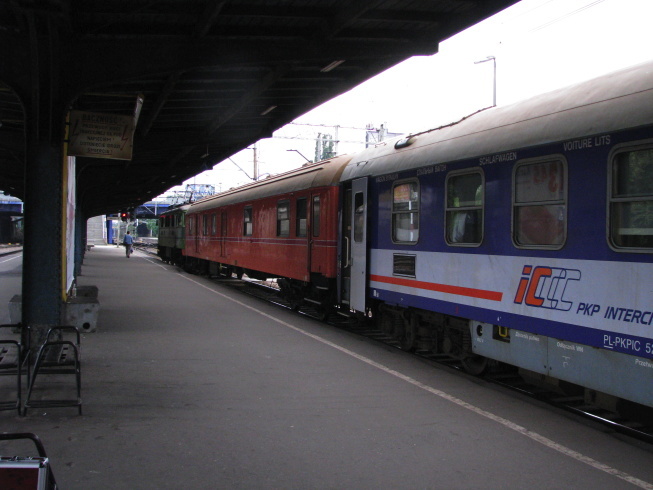 Warsaw-bound train waiting at Gora Kalwaria. Gora Kalwaria is a dormitory suburb some 30 km by road to the South of Warsaw. It lies on the Skierniewice – Lukow line and was also linked to Warsaw from 1900 until 1971 by a 1000 mm gauge railway. Although several thousand people commute daily from Gora Kalwaria to Warsaw, for the last 15 years the station has been without any passenger services. During the rush hour the car journey can take up to two hours. Koleje Mazowieckie (Mazowia Railways) suggested restoring train services between Gora Kalwaria and Warsaw and. Barbara Samborska, the Mayor of Gora Kalwaria, made 170,000 PLN available to resurface the platform at the station and provide shelters. The first train ran on June 2. Among those present at a short ceremony at Gora Kalwaria Station was Janusz Piechocinski, deputy chairman of the Sejm Infrastructure Committee. 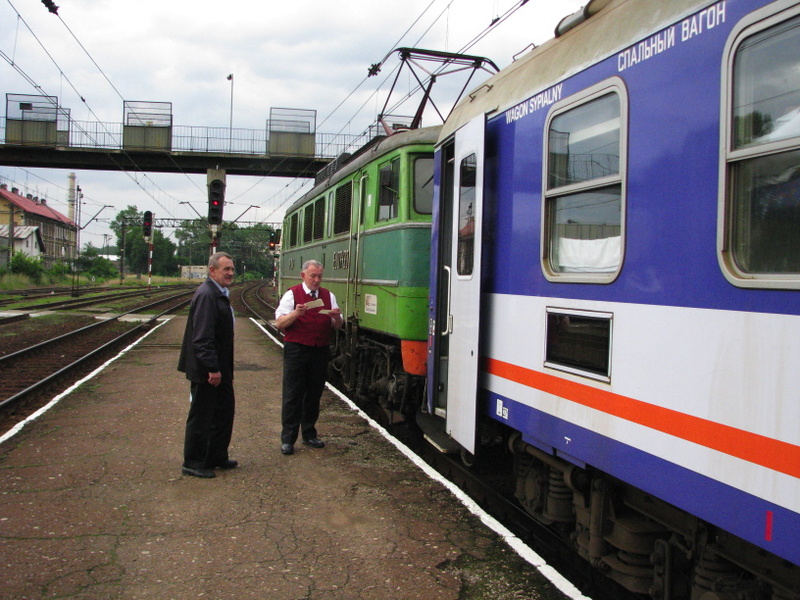 At present 4 trains a day link Warsaw and Gora Kalwaria with one of the trains continuing to Pilawa. Trains from Gora Kalwaria join the Radom – Warsaw line at the 4-way junction at Czachowek. Michael Dembinski has written several articles about the new service and describes a couple of journeys along route on his blog Wwa Jeziorki. As always the accompanying photos are terrific. He delights in Poland’s sylwan railway junctions. I’m mentioned Czachowek a few times; it is a railway junction some 10 miles/16km south of Jeziorki. It’s noted for having a couple of hundred inhabitants and four railway stations. Two were out of use, though with the new rail service, Czachowek Wschodni has been re-opened. Mike has even provided a helpful little diagram showing where the stations were. So I thought I should include a diagram of my own. 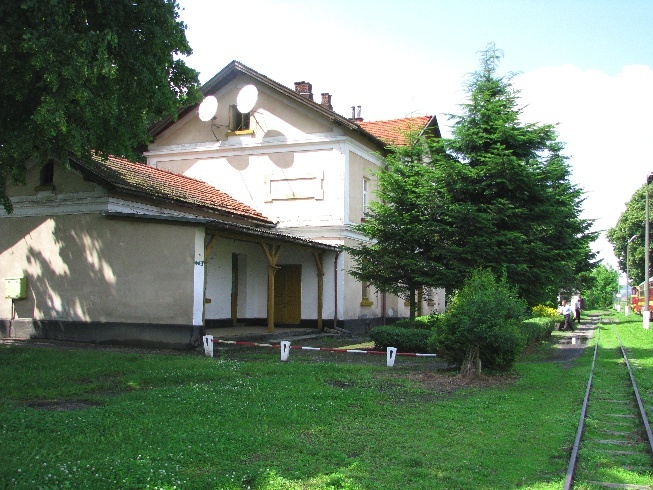 In its prime Czachowek had 6 railway stations, not four! PKP’s Estates Company, PKP Nieruchomosci, are offering ‘Kriegslok’ Ty2-1226 for sale by tender. 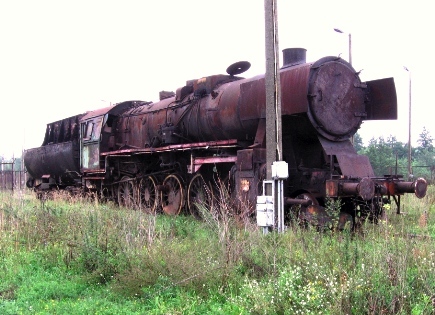 The locomotive, works number 12524 was built by Maschinenbau-Actien-Gesellschaft (BMAG), in Berlin.The locomotive was withdrawn from the active stock list in Febuary 1991 and served for several years as a stationary boiler at Tluszcz. It is in ‘ex-Barry’ condition. Tender documentation can be requested by e-mail from PKP Nieruchomosci at: wwa.mienie5@pkp Further information can be obtained from Bogdan Rozycki (Roo-jy-tzki) tel. 022-47-458-93 between 08.00 – 14.00 hrs. Offers have to be submitted by 09.30 hrs on 23 June 2009. There is an indicative price of 91.830,00 PLN. Tenders have to be accompanied by a 10% deposit. Still from time-lapse photography film shot by Network Rail at Bathgate during July 2008, when the Bathgate and Edinburgh line was closed for 16 days. During this time 200 staff, shifted 12,500 tonnes of ballast, laid 3,000 metres of track and fitted 12 points. The £300m Airdrie to Bathgate Rail Link Project is one of Network Rail’s flagship investments in Scotland. The project will reinstate the Bathgate and Coatbridge Railway between Airdrie and Bathgate, which was closed to passengers in 1956 and to freight in 1982. It will link the North Clyde Line of the Glasgow suburban railway network, which currently stops 2km beyond Airdrie at Drumgelloch, to the Edinburgh to Bathgate Line. The line will be double-tracked and electrified from Edinburgh to Glasgow and passengers will be able to travel from Edinburgh Waverley station to Glasgow Queen Street Low Level in 74 minutes. It will provide a fourth rail link between Glasgow and Edinburgh, complementing the existing 50 minute “shuttle” services which run via Falkirk. The project also involves a £7.3m diversion of National Cycle Route 75. After the Airdrie-Bathgate line was closed in 1982, 16 km of railway line became a public footpath and cycle track. This section was closed on 19th October 2008 to allow work to begin on the reinstatement of the line. It is planned that by the end of 2010 a new cycle path will run alongside the reopened railway line, connecting local communities to new stations along the route. Although the new railway is being built on the track of the old, a £ 3.8m contract was awarded to Norwest Holst Soil Engineering to carry out ground and site Investigations. Given the need to minimise risk and comply with modern environmental legislation – a not unreasonable decision. So it is with some incredulity that we read an article in the Daily Express that Network Rail contractor Carillion – who won a £80 million contract for works on the line – lost a £40,000 mechanical excavator in a peat bog near Armdale! It is reasonable to ask the question, how did Norwest Holst’s soil engineers manage to miss this little bog? Perhaps they were running late and decided to skip forward a bit? Or were Carillion just too busy to read Norwest Holst’s report? However, accidents do happen and, faced with a 20 ton excavator buried up to its roof, not many of us would know what to do. Carillion’s workmen have to be congratulated for coming up with an unusual solution. They covered the remains with branches! Unfortunately the Scottish Environmental Protection Agency does not see things the same way and has now launched an investigation over fears that pollutants inside the machine could seep out. Forest narrow gauge railway, but where? Nobody identified the location of the last tie breaker! I have spent half of today applying to become a Member of Network Rail and the other half sorting out a dusty suitcase of railway photographs. What a strange collection? Who else, I wonder, would keep photos of steam engines in the Gdansk shipyard mixed up with shots illegally griced at Willesden MPD? Or Southall Shed and Szczecin? Or Feltham Depot and a Forest Railway somewhere in Poland? Which brings me to today’s mystery photograph. One of the bonuses of being an advocate of railway revival is that sometime your co-workers give you copies of their photographs. But in the case of the photo above and its companions, I forgot to take a note of the location and I have lost touch with the photographer. Do you know where the above photo was taken? And can you prove it? It’s a tie-breaker so there is only point. Good luck! Gavin Whitelaw, who has his own website of amazing photographs, called Vintage Britain has kindly offered to fund a prize for the winner – a bottle of Zubrowka, Bison Grass Vodka. After three years of discussions, meetings and investigations, the takeover by local government of the Ostroleka-Lapy line looks set to go ahead. 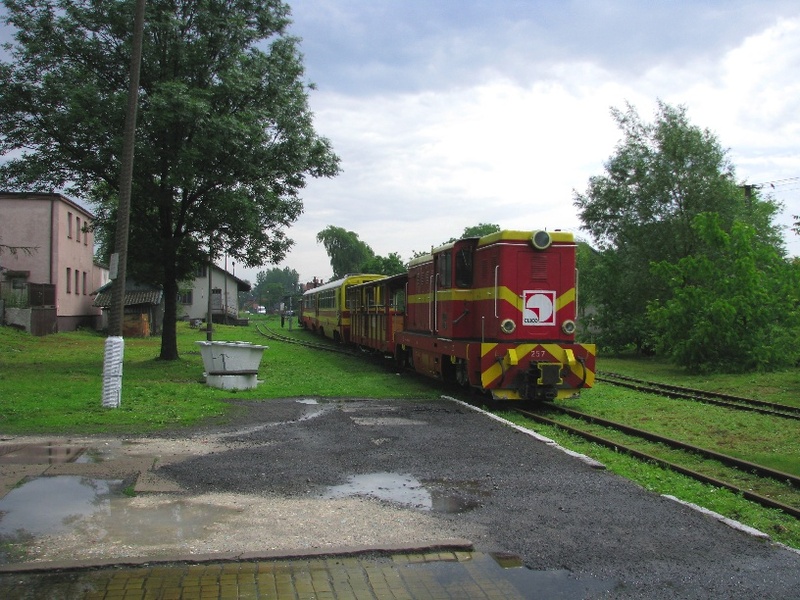 BTWT has been informed by a reliable source that Krzysztof Kozicki, the Starosta (Chief Executive) of Lomza District Council, is about to make a formal application to PKP for the transfer of the Ostrolka – Sniadow section of the line including the branch to Lomza, At the same time, Jozef Zajkowski, the Wojt (Chief Executive) of Sokoly Parish Council, is applying for the transfer of the Sniadow – Lapy section. Kozicki is interested in re-establishing a commuter serviceto Warsaw. Zajkowski wants to safeguard his freight services and to exploit the line’s tourist potential. If all goes well the result will be a standard gauge line, ‘preserved’ Polish style, within 60 miles radius of Warsaw. Steam specials or footplate trips anyone? The Mayor of London, Boris Johnson, comments on the tube strike. Part of the Mayor of London’s website. Please find below a letter I have today sent to the London Mayor. In response the Mayor has refused face to face negotiations and London Underground are trying to deny an agreement was reached. The Mayor even walked out of a TV debate today rather than deal with me directly. City Hall and TfL seem to be in disarray. I have again told the Mayor that an agreement was reached last night but was then vetoed and as such the Mayors management team last night clearly did not have the authority to conclude an agreement and have said I am available for direct talks with him and / or his Transport Commissioner. I am very confident that thanks for your magnificent support for the strike that we are in a position soon to reach an agreement. Let’s keep up the pressure to protect jobs conditions and for a decent pay deal. This is my 31st year as a member of the RMT and a worker on London Underground and in all that time I have never experienced such dishonesty from any management that I have dealt with. I am writing to you as both Mayor and Chair of Transport for London to urge you to agree to direct face to face talks with myself to resolve this dispute and to also address the pack of lies that have been fed to media. The facts are that yesterday the RMT negotiating team and myself attended nearly seven hours of talks at ACAS and the end of which I was confident we had the basis of agreement which could settle this dispute. On the question of pay your management made a revised offer of a two year deal or four year deal. It was agreed that would go away, speak to our members and representatives and come back to them. We said it didn’t need to be decided immediately and that we would suspend the action on this issue. With regard to disciplinary procedures it is an out and out lie that we were only interested in the two sacked drivers, instead there have been widespread and prolonged abuse of the procedures. It was therefore agreed that ACAS would look at all cases and we said that we would be able to suspend the action to allow this to go ahead. Simarly we agreed an end to management abuse of sickness procedures. In respect of redundancies we were simply asking for your management to honour a longstanding agreement reached in 2001 that there would be not compulsory redundancies. You will be aware that this agreement was borne out of well founded fears that the part privatisation of the tube would be a disaster for tube users and workers alike. At 6 o’clock last night and an hour before the strike was to begin, this issue was also agreed with Acting Managing Director, Richard Parry. In fact I signed a document to this effect and this was to go back in front of RMT Executive immediately so that we could suspend the strike. Then astonishingly at 6.35 whilst awaiting the final typed agreement we were told by management that they had made a phone call and that they could no longer abide by the agreement – they reneged before the ink was even dry. We were stunned that management could be so dishonest. I have no doubt that the phone call made was to the Transport Commissioner or City Hall who instructed the management team to pull the agreed deal. It is an absolute disgrace that we should reach an agreement in good faith only for that agreement to be sabotaged. Either your senior management are completely dishonest or have no authority to negotiate. Or it is the case that you have personally intervened to scupper the deal in the belief that a confrontation with tube workers will serve your political agenda. Londoners will be appalled that you are playing politics with the tube and will be entitled to ask why you, not only as Mayor but also as Chair of Transport for London are running away from face to face talks. It is absolute nonsense, as some are trying to suggest, that there is some personal animosity between us. I am prepared to meet you anytime and anywhere to resolve this dispute and look forward to hearing from you by return. I am copying this letter to members of the Transport for London Board, members of the GLA and London MPs. Deserted platforms at Greenford station. Behind the bushes is the spur from the GWR mainline at Old Oak Common to the GW&GCJR extension from South Ruislip to High Wycombe. It is here that Dyspozytor used to see Kings and Castles speeding to Birmingham in the 1950s. Photo by Sunil060902. Oyster pay as you go is being accepted on National Rail journeys in Greater London. reply the train operators. See below for a very informative thread. More on the background to the strike. The link should work for seven days. Transport Briefing – Underground shut down as RMT strike does ahead. BTWT has had a phenomenal 14 months. Reaching a cumulative daily total of 108,000 hits is quite an amazing achievement for a first-time blog, and at one moment our readership growth was actually outstripping that of Tom Harris’s And Another Thing, one of the most candid and interesting blogs published by a member of parliament. However, over the last 5 months our monthly totals have been hovering steadily at a few hundred over the 9,000 mark, and it has become clear that, if we want to go further, something has to change. We have a core readership of some 300 readers who enjoy the juxtaposition of English and Polish railway news and see nothing strange in reading about what that the deputy mayor of Smigiel said to Howard Jones one day and what the former minister said to Gordon Brown the next. However, we see our future growth coming from two distinct groups: those who are actively interested in Poland, including the country’s railways; those who are interested in why the UK’s railways are in such a mess, and would like to do something about it. Starting 14 June, we will be publishing a sister blog, Tunnel Vision, to cover rail developments in the UK. Like its parent, Tunnel Vision will be a campaigning blog. It will disect government transport policy and showcase local efforts to open new rail links and improve rail services. We will write about what tactics have worked in one part of the country with a view to other groups reusing proven-to-work methods elsewhere. Meanwhile BTWT will sharpen its focus on Poland and carry more news stories. Until 1st July, both blogs will carry UK articles, after this date BTWT will have a primarily Polish focus. (One is reminded of how the Metropolitan Railway and the Metropolitan and District Railways built parallel tracks until they came to an agreement over running rights!). Tunnel Vision is beta testing right now. If you would like to help us give it a final polish, please drop me an e-mail at railfan [at] go2 [dot] pl. Do not forget to remove the spaces!